OSGi dependency management explain, how components or bundles share code between bundles. OSGi is dynamic component development so each application composed of components. Dependency Management define how code can be shared between bundles or we can say how we can access one bundle classes/interfaces in other bundles. When we develop OSGi bundles any class or interfaces which we developed in the bundles accessible to within the bundle and not outside the bundle. Dependency management will explain how we can access one bundle resources in other bundles. Create new bundle using eclipse with activator class. This bundle will have one interface and its service implementation. We already created bundle and now create Service Interface and define the service. We already define the service interface with method. Now we have to implements the service method in the implementation class. Create new package and new implementation class. 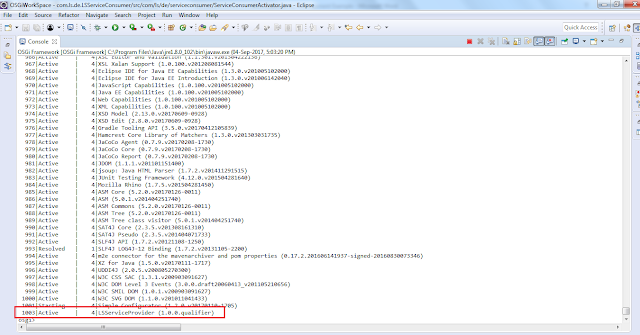 Implement interface method in the implementation class, finally implementations class as follows. Now we have to Export Services package from services bundles so that these interfaces or resources can be accessible in the other bundles. Remember here only we are exporting services package not implementation package. MANIFEST have OSGi header called “Export-Package” and we need to add package names with comma separate value, so that we can access these resources in other bundles. Now we need to register service implantation in OSGi Bundle Context so that it will be accessible to other bundles. The services registration and unregister information will managed by Service Registration object. When we register Service Implementation object with Bundle Context it will return Service Registration Object. Bundle Context have methods registerService(--) and unregister(--) methods to register and unregister service objects. 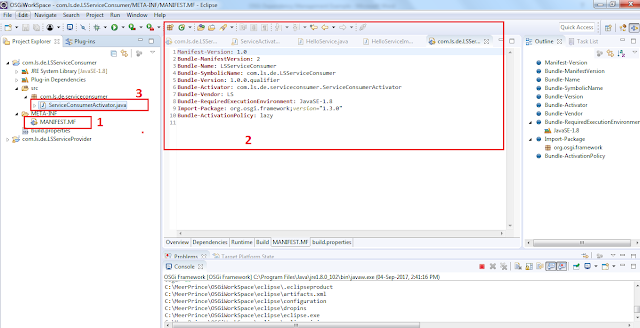 Its Java MAP object to filter the service objects. Sometime same interface have multiple implementation then we will use some filter properties to identify the service implementation object. 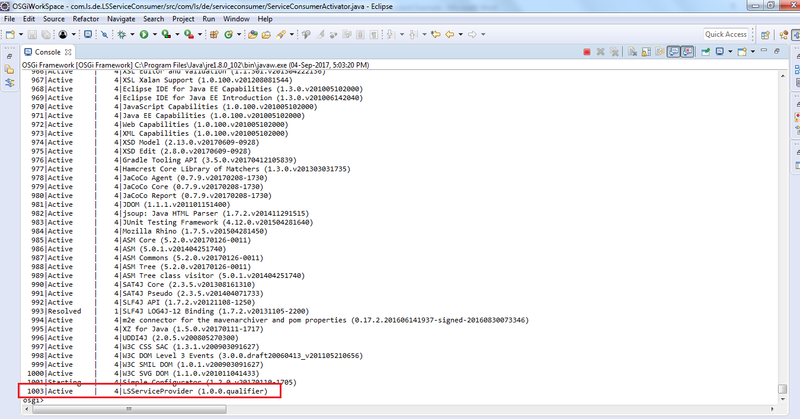 Service Identification is same for all implementation so we will additional properties to get service objects. In this example we have only one implementation so we have passed null. unregister(--) method will unregister service object from Bundle Context. Usually we unregister service when bundle is removed from the container then it will call stop(--) lifecycle method. We will unregister service when it execute stop(--) method. 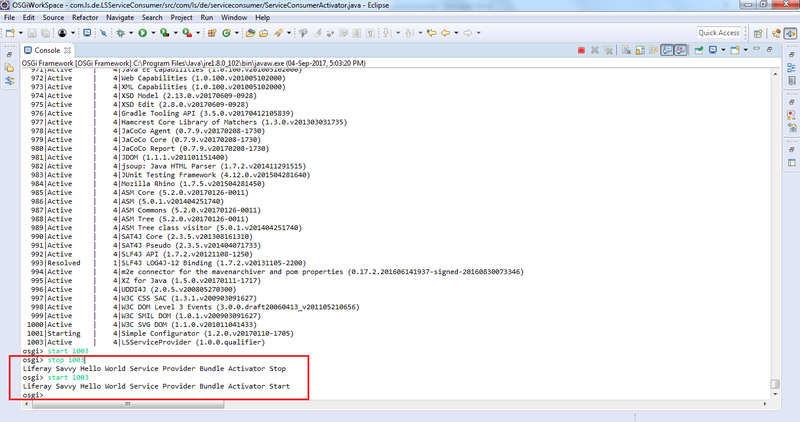 Now go to Bundle Activator class add following code parts in the start (--) and stop (--) methods. Create new bundle using eclipse with activator class. We have to Import Services package from services bundle so that these interfaces or resources can be accessible in the consumer bundle. MANIFEST have OSGi header called “Import-Package” and we need to add package names with comma separate value, so that we can access these resources in current bundle. When we use import header then the listed java classes and interfaces are available in the current working bundles. We already register services object and exported package in the consumer bundle. Now we can user service implementation in the consumer bundle. Now we can access service implementation object from consumer bundle context. 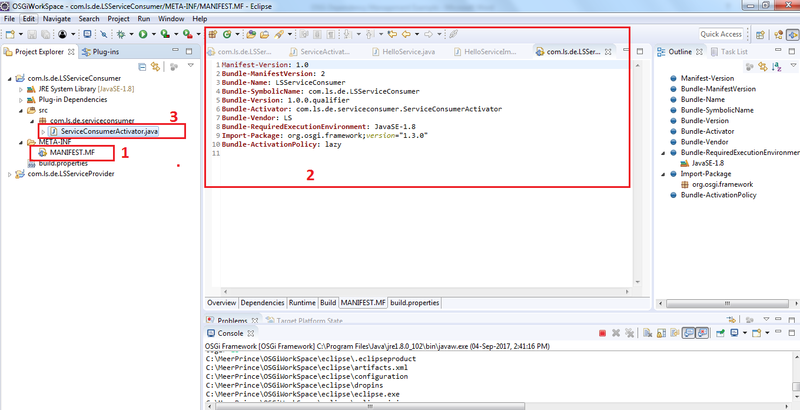 We have Bundle Context getService(--) method and it will return the service implementation object. We need to pass service reference object for this method. We will identify the Service Implementation Object by service interface name. We already register the service with same name. So we will use same name to identify the service implementation Object. We will use consumer Activator Class to get implementation object and call the required services. 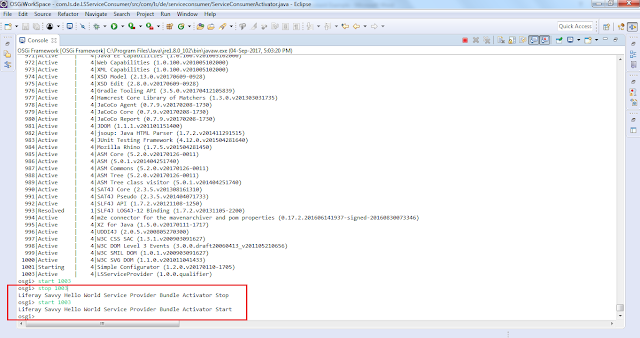 Go to Consumer Bundle Activator class add the following code part in the Start (--) method and invoke service method using service implementation object. We have two bundles Service Provider Bundle and Service Consumer bundle. Service Consumer bundle dependence on Service Provider Bundle. 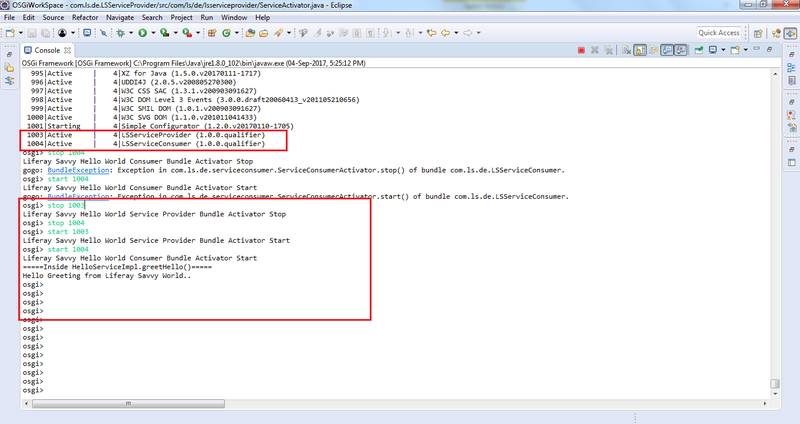 So we have to activate Service Provider bundler before access services in the consumer bundle. Basically we need OSGi implementation bundles that equinox and we can also use other implementation as well like apache Felix. Other two bundles are that we developed. Select only service provider bundle so that only provider bundle will be executed. Once you run then bundle will activated you can see messages in the console. In the console just type OSGi gogo shell command to list the bundles then you can see Service Provider Bundle in the list and we can see status that is activated. Now you can see Service Provider bundle in the list with active state and bundle number. We will use bundle number to start or stop bundle in the OSGi container. The following console shows Invoking Service Provider Bundle Life cycle methods. Service Provide Bundle is activated and Now execute Service Consumer bundles so that it will invoke the greetHello(--) method which is implemented in the Service Provider bundle. Basically we need OSGi implementation bundles that equinox and we can also use other implementation as well like apache Felix. Other two bundles are that we developed. Select both bundle and click on run. Hello Greeting from Liferay Savvy World..